The following illustration isn't just pretty; it's also pretty appropriate--especially if you're aware that before they settled on Mega Man the brass at Capcom contemplated calling their now-iconic character Rainbow Man. German artist bartotainment is responsible for the image above, by the way. To see more examples of his work--the bulk of which is game-inspired--pay a visit to his Flickr photostream. See also: Mega Man, Rock Man or ... Rainbow Man?!? 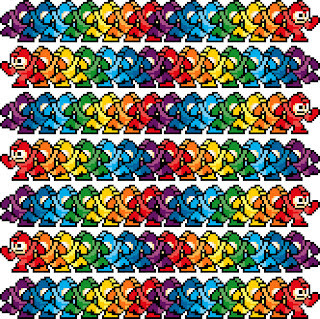 Can we have Rainbow Mega man? As for your comment: I'm guessing you're asking for some sort of "Rainbow Power" or weapon for Mega Man? Or are you asking for a rainbow-colored Mega Man? Either one sounds good to me! 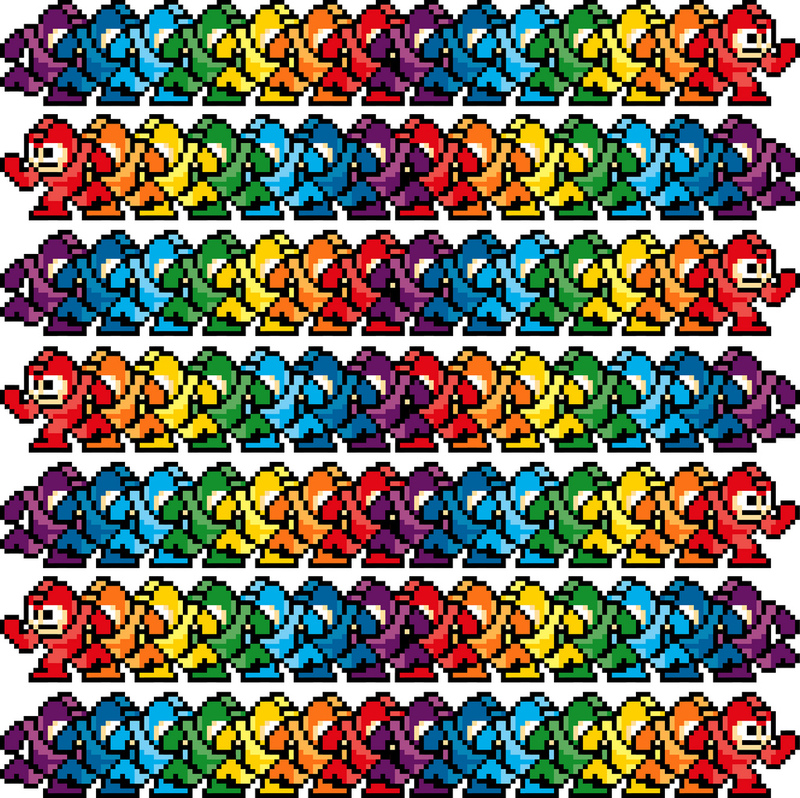 I think I want a rainbow of Mega Men (Mega Mans?) tattooed across my shoulders. Now, *that* would be an interesting tattoo! I'll bet it would take a while, though, if you wanted them to be accurate with the pixels. BTW, a few people on Twitter suggested this would make a great t-shirt design. I agree! seeing it as an tattoo would be great!!! if you use it for a tattoo i would like to see a photo of it, justin! I think I'd stick with a T-shirt, since I'm not a tattoo kind of guy. I've got a problem committing to a tattoo for life...but if they made it a T-shirt, I'd like to see them a little more spaced out and only in one row. Justin: I'm with you! Tattoos are waaaaay too permanent for me. A t-shirt, though, would be great. Oh, and I like your idea of seeing just one line of them.